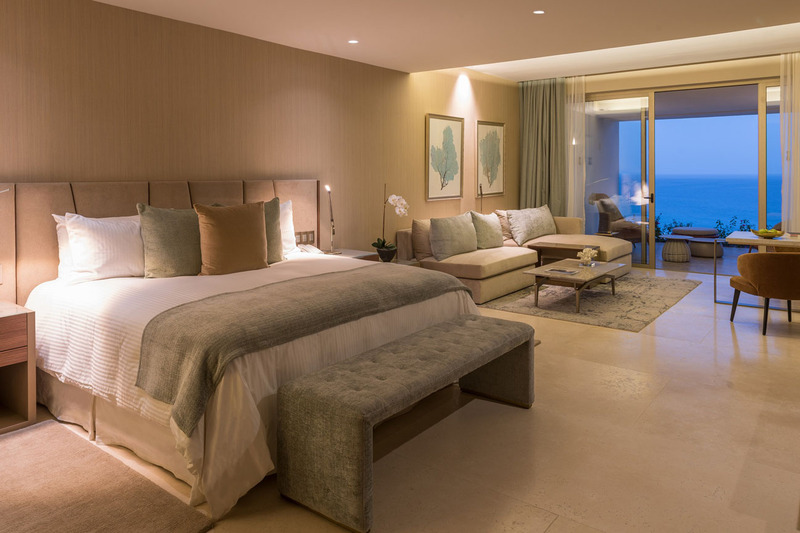 The new year is being heralded in high style in Los Cabos, Mexico, with the opening of its newest upmarket resort, the Grand Velas Los Cabos. The new Grand Velas Los Cabos is a beachfront property that offers dramatic ocean views and unique spaces in virtually every area of the resort. The property features 304 ocean view suites ranging from just under 1,200 square feet to over 3,400 square feet. All include private terraces with sitting areas, separate living area with sofa, king or two queen beds, expansive bathroom with Jacuzzi and built-in shower and, in some suites, personal plunge pools. Suites feature all the amenities travelers expect today, and more: Daily stocked premium mini-bar with refreshments and snacks, red and white wine from Ensenada, Nespresso Coffee Maker, high definition flat screen with digital cable TV, L’Occitane bath amenities, and goose down pillows and comforters. A pillow menu is also available for those who prefer something other than goose down. The resort is an oasis created to exist harmoniously within the rugged topography of its environment, according to developers. Situated in the midst of the area’s contrasting landscapes of beaches, boulders, desert and the deep azure blue color of the sea, the resort’s earth tone color palette was chosen to reduce the glare that the strong desert sun produces when reflected off light-colored buildings as well as to integrate the property into the character of Los Cabos. 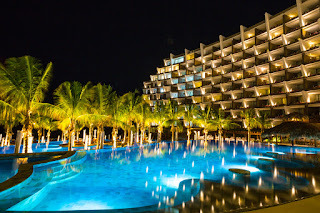 The resort offers the next generation of all-inclusive amenities and facilities including the property’s signature restaurant, Cocina de Autor, which is helmed by two star Michelin chef Sidney Schutte. Other on-property fine dining options include Frida, offering Mexican fine dining; Piaf, which serves gourmet French specialties; and Lucca, with a menu of traditional Italian cuisine. In addition, the resort has several casual dining venues and also offers in-suite dining. Libations are offered in bars with four distinctly different surroundings: Sky Bar, Miramar Bar, the bar at Cocina de Autor, and Koi. In addition, the resort engaged Master Sommelier Don Pedro Poncelis Brambila to develop the wine list, which comprises 50 included varieties of sparkling, white, rose and red wines from the best regions of the world. In addition, the resort offers a supplemental list of over 200 wines from the world’s best and most prestigious domaines. Other signature facilities and services include a two-level, 35,000 square foot Leading Spa of the World, complete with 16 treatment rooms, a hydrotherapy facility, personal trainers, exercise programs, yoga, Pilates and meditation and duplex wellness suites with juice bars; three swimming pools with pool and beach concierge service; and wine-based features inspired by the proximity to the region producing Mexico’s fine wines. A gallery of contemporary art slated to open in the near future will continue the company’s commitment to bringing the art, fashion and culture of Mexico to guests. Located between Cabo San Lucas and San Jose del Cabo, Grand Velas Los Cabos is just 35 minutes from Los Cabos International Airport (SJD) which offers direct service to more than 40 destinations in the United States, Canada and Latin America. Rates start at $750 per person per night, double occupancy, and include luxury suite accommodations, a la carte gourmet meals at a variety of specialty restaurants, premium branded beverages, 24-hour in-suite service, fitness center, and nightly entertainment in addition to other amenities. 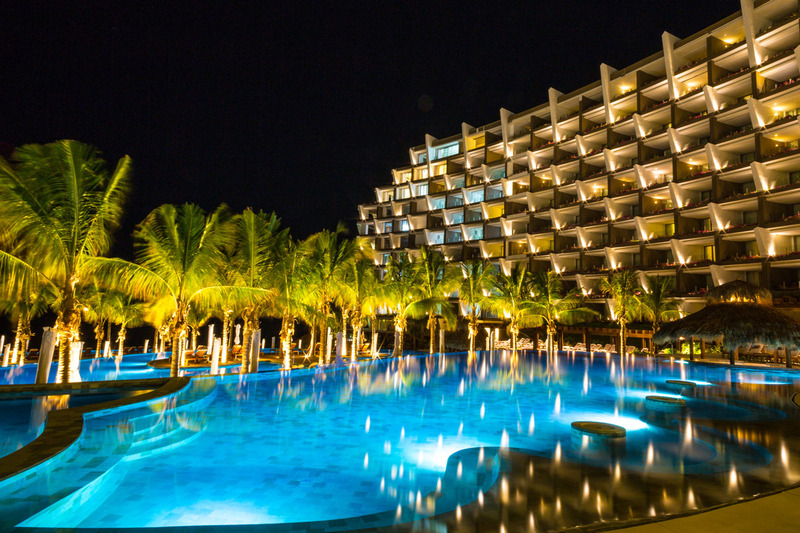 The $150 million resort on Mexico’s Baja Peninsula is the fifth property of Velas Resorts, which operates a collection of exclusive resorts in many of Mexico’s most prestigious destinations. More reservations or information on Grand Velas Los Cabos are available by calling 1-888-407-4869 or by visiting the property's website.